A new option has been added to SmartBots Group Chat service: now you can add resident to the blacklist without leaving the chat page. The first option (“Eject resident from the group”) controls wherever you want to eject selected resident from the group members. If this option is checked, and resident is not in the group, operation will fail. The second option (“Add resident to blacklist”) controls if you need to blacklist resident, and prevent him/her from joining the group. You may blacklist person even if he is not a group member at all. SmartBots Anti-Spam device has been improved: the new WHITE LIST directive has been added to the config notecard. This directive allows to specify the avatars you trust (for example, managers or your Second Life bots). These avatars will be able to say anything, including the “forbidden” words. 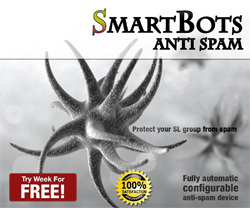 SmartBots Anti-Spam is a special device which monitors your group chat activity. You specify the list of forbidden words and phrases, and it ejects anyone who says them. It is possible to warn the abuser once before actually ejecting him from the group. The device is available in SL Marketplace: get it here for free. Launching the Group Chat Translator service! We are proud to present the new group service of SmartBots: the Group Chat Translator! This service provides you with a bot which translates all group chat to the language you specify. The service costs L$39 per week and can be used with other services (Inviter, Notices) or without them. Please feel free to send us your wishes and comments! The live translator is always working in “SmartBots: group invitation bots” group – you can join the group and test the translator yourself. We were testing this service in our groups for few weeks, and have to say that translator is a really amazing and funny addition to your chat! You can turn the Chat Translator service for any of your groups in your account. The translator management device is available at SL Marketplace for free. This is automatic device which monitors your Second Life group for spammers and beggars, and eject them from the group (with or without giving a warning). Antispam device is very easy to configure (it supports words, phrases and wildcards) and lightweight (1 prim only). It’s available at SL Marketplace already – click here. This is a plugin for famous adboard rental system developed by Intelli. We’ve created the group inviter plugin which invites your tenants to the group (any role, closed enrollment allowed) and ejects them when they got evicted. Plugin is configurable using the config notecard and also available at SL Marketplace. P.S. I really appreciate the help of our customers who helped developing and testing these products! Thank you very much!